A question I have been reflecting on since my second year of seminary is, “what’s new about Pentecost?” In other words, in what ways is the activity of the Holy Spirit in Acts 2 continuous with the Spirit’s work throughout the Old Testament, and in what ways is it new and unprecedented? The question is important, in my opinion, partly because it forces us to think through how the whole Bible fits together, and partly because the way we understand continuities and discontinuities in the Spirit’s work across redemptive history affects the kinds of continuities and discontinuities we might draw between Pentecost and today. 1) First, Pentecost is not completely new. It is clear from Scripture that the Holy Spirit is at work in many ways prior to Acts 2. To begin with, Spirit-wrought regeneration occurred among God’s people prior to Pentecost. Jesus’ dialogue with Nicodemus in John 3 seems to imply that being born of the Spirit is something Nicodemus should already understand, and David’s prayer after sinning with Bathsheba pleads for God not to remove the Holy Spirit from him (Psalm 51:11). The Spirit also seems to give gifts and skills to God’s people. Bezalel is gifted to build to tabernacle by being filled “with the Spirit of God, with ability and intelligence, with knowledge and all craftsmanship” (Exodus 31:3, cf. 35:31). When Joseph accurately interprets Pharaoh’s dreams, Pharoah asks, “can we find a man like this, in whom is the Spirit of God?” (Genesis 41:38). The Spirit also inspires prophecies in Balaam (Numbers 24:2), Azariah (II Chronicles 15:1), Zechariah (II Chronicles 24:20), Ezekiel (Ezekiel 8:3, 11:24). Moreover, while the Spirit is not always mentioned in connection with God’s other various workings in Israel, the prayer of Nehemiah 9 makes it clear that it was the Holy Spirit who was instructing the Israelites through the law (Nehemiah 9:20) and warning them through the prophets (Nehemiah 9:30). In addition, in I Samuel 10:9-13 and 19:20-24 we even have something akin to the more spontaneous and “charismatic” prophecy of the New Testament. This is a strange text, but this much is clear: (1) prophesying appears to be a visible phenomenon here, (2) prophesying is connected to the Spirit “coming” on someone, and (3) it seems to be a powerful experiential reality, considering that Saul engages in it all night long, and each set of men do it as well. (One reason this text is important is because it shows the wide semantic range of the term “prophecy.” Mostly the focus seems more on authoritative speech; but at times the term seems to denote the more general experience of being under divine influence.) To summarize, its clear that the Holy Spirit is significantly at work throughout the Old Testament – in many of the same ways that He is at work in the New Testament (giving gifts, inspiring prophecy, and inwardly cleansing). 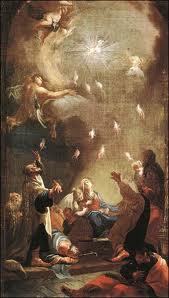 So in many respects Pentecost is not new. I understand this transition in terms of the larger transition from a people defined by physical descendent from Abraham (Genesis 17:7) to a people defined by spiritual descent from Abraham (Galatians 3:7). When God’s people was a physical nation as well as a spiritual people, there were always a number who were physically circumcised, but not inwardly circumcised (Jeremiah 9:25-26). Now the very definition of a member of God’s people is the inward appropriation of the sacrament (Galatians 3:27, Romans 6:3, Philippians 3:3). So by definition a member of God’s people now also has the Spirit. All this is related to my belief in covenantal credo-baptism. 3) Third, Pentecost is qualitatively new. It seems to me that the mere extension of the Spirit outward to more people does not exhaust the newness of Pentecost: the experience of the Spirit here is also more powerful, more dynamic, more abundant. That Pentecost is new internally as well as numerically is in my mind indicated in the (unprecedented) language used to describe the experience: the verbs “pour” and “baptize,” for example, both seem to convey a flooding, an infusion, an engulfing experience nowhere depicted in the Old Testament. Moreover, the mere extension of the Spirit to more people does not seem in itself to be able to account for the way Pentecost is spoken of elsewhere in the New Testament. For example, John’s gospel can state that the “Spirit was not” before Pentecost (John 7:39). This cannot mean that the Spirit was not at all at work prior to Pentecost, as we saw in (1) above; it seems to suggest such a dramatic and qualitative newness to the Spirit’s work that it can be thought of as, quite simply, when the Spirit comes. Otherwise Jesus would not have told his disciples throughout the upper room discourse that he would send the Spirit to them after his ascension (14:16, 15:26, 16:7). He would simply tell them to look around – He’s already here. 1) Its the fulfilment of the Old Testament hope in Joel 2:28-32 for the pouring out of the Spirit during the “latter days,” as well as the fulfillment of a New Testament expectation for a more powerful effusion of the Spirit (Acts 1:5, Matthew 3:11-12 and its synoptic parallels). Pentecost thus seems to be the inauguration of an era of redemptive history toward which the whole Bible is gearing (cf. I Corinthians 10:11). 2) Significantly, Pentecost marks the first time speaking in tongues occurs, which stays on the scene thereafter (Acts 8, 10, 19, I Corinthians 12-14). This sets Pentecost apart even from the “charismatic” prophecy in I Samuel 10 and 19. 4) The transformation of the disciples from their weakness during the gospels to their boldness in Acts occurs at Pentecost. Even after meeting with the risen Christ in Acts 1, the disciples are not yet evangelizing: they are waiting (1:4). Pentecost is the turning point for them. My conclusion is that what is new about Pentecost is this: it is the inauguration of a new era in redemptive history in which the same Spirit which was at work previously is poured out more universally among God’s people and with far greater measure of influence and power. You have an article here! #1 under your third point, about redemptive history, is fascinating to me. BTW you might be interested in Beale’s article in TynB arguing that the descent of the Spirit in Acts 2 is the coming of the latterday eschatological temple–the abiding presence of restored fellowship with his people. He points out that the visible phenomena such as tongue and fire etc are employed in Jewish lit to describe God’s presence in the temple.